Today marks four years since the start of the conflict in Yemen. At least 10,000 innocent civilians have been killed by shells, bombs and bullets. But the war has also killed the economy and public services. Millions of people have lost their livelihoods. Health services have collapsed. As a result, at least 100,000 people have died from hunger and illness. 60,000 are suffering famine right now and dying. Another 5 million people are on the verge of famine. 15 million people depend on aid for food. To stay alive. I was in Yemen a few weeks ago and saw directly the impact of the war on ordinary Yemeni people. Everyone I met just wanted the war to stop and they wanted other countries to stop sending arms and soldiers to Yemen. “Just uphold your own Arms Trade Treaty,” I was told. During my visit, we drove from the capital Sana’a, which is up in the mountains, down to Hodeida, the Red Sea port which is the gateway for most of Yemen’s food and fuel. In the past, this drive would have taken four hours. Today it takes eight. Because every few miles there is a checkpoint, often with an armed teenaged boy asking to see our permission papers to travel within the country. But also because the main road from Sana’a to Hodeida is blocked. Because it is a strategic military position. So instead, we have to take a 100 mile detour. In Hodeida city the signs of the recent fighting in 2018 are everywhere. Destroyed buildings and military installations. In many neighbourhoods, the streets are deserted. Windows closed. No one about, no traffic. But since a ceasefire – just in this one city – in December, there is an uneasy calm. Life is trying to go on as normal in a few noisy streets. And there are little reminders of the popular seaside resort this used to be. A pearl and oyster roundabout fountain – with no water. A seafood restaurant serving prawns the traditional local way. And you can see miles of beautiful beach, behind the sandbags and barbed wire. A few days later, in Aden, I met Iman. She told me of “the beautiful life she used to live” in Hodeida. Her husband and 16 year old son ran a successful business, driving taxi cars. She had five other children aged 4-13. Her younger sons were in school, though not all of her daughters, because her husband didn’t approve. They had a nice house and an income. Then in the summer of 2018, there was a huge battle for Hodeida. From the air and in the streets. Innocent people died. There were bombs and shells for weeks. Iman sheltered in her neighbour’s house, further away from the fighting. She said they began to plan their escape. I asked her what she packed in her bags, ready to go. She said they couldn’t take anything. If it looked like they were leaving the city they wouldn’t have been allowed to go. So, when Iman’s house was finally destroyed, she left with her family, with only one change of clothes in their bags. They left behind their house, their business, their children’s schools and all of their belongings. And now, Iman is living in an improvised shelter in a poor, dusty village on the outskirts of Aden, 300 miles away. Her husband had two wives and can no longer support two families. So she divorced him. 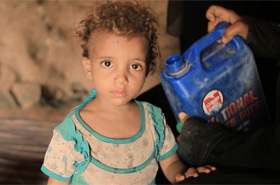 When Iman arrived in Aden, she had to beg and borrow food from equally poor neighbours, to feed her family. In August 2018, CARE started a programme, funded by UK aid from the Department for International Development (DFID), to support people who had fled from Hodeida. In this area, we supported people through a cash for work programme. This means that they earned a living to pay for food, had the dignity of employment, and contributed to improving a local school so that more of the extra children in the area could go to school. Iman used some of this cash to put a first payment down on a motorbike, which her 16 year old son started using again to give taxi rides in the nearby city of Aden. Her 13 year old son goes to the school that Iman helped to renovate, every morning. In the afternoon, he works odd jobs in the local village for neighbours. Just a few months’ salary helped to stabilise Iman’s family. But she will need more work again soon. And that is why Iman, and everyone in Yemen, needs the war to stop now, so the killing stops and the economy can recover and the famine can be stopped before it kills millions more people. In the meantime, aid is getting through to millions of people in Yemen every month. 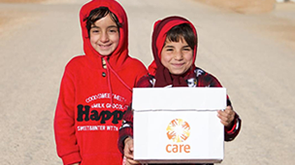 CARE supports one million people a month with food, cash, and water. As the war enters its 5th year and the human suffering continues, please support CARE’s work and remember the millions of people like Iman who only want this war to end.